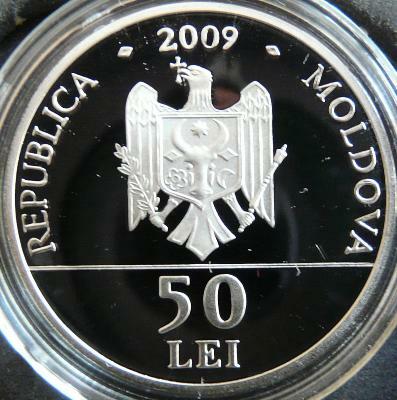 year 2009, circular inscription REPUBLICA MOLDOVA meaning "REPUBLIC OF MOLDAVIA" and the coat of arms of the Republic of Moldavia, in exergue denomination "50 LEI" map of the Republic of Moldova, deasupra traseul folosit de Struve pentru triangulaţia arcului de meridian, punctul geodezic Rudi, cîteva construcţii geometrice ajutătoare, în stînga un fragment de meridian cu trei coordonate de paralele - 46°, 47° şi 48°, inscriptions RUDI and ARCUL GEODEZIC STRUVE meaning "STRUVE GEODETIC ARC"
The coin was struck by the Czech Mint. Belongs to the series Monuments of Moldavia, together with the 50 lei coin from 2008 featuring the Oak of Stephen the Great from Cobîlea, with the 50 lei coin from 2010 featuring the Orheiul Vechi nature and cultural reserve and with the 50 lei 2012 coin featuring the Soroca Fortress. Astronomer Friedrich Georg Wilhelm von Struve (1793-1864) was born at Altona, in Denmark (today Germany), to a family that gave a long series of astronomers. Together with his family, he emigrated to the Tzarist Empire, were he followed college and reached the position of director of the astronomic observatory of Tartu (in Estonia, at the time inside Russia; the town is also known under its German name, Dorpat). In 1838 Struve became the director of the well known astronomic observatory of Pulkovo, near Petersburg. The Struve Arc is a chain of 258 gigantic triangles built in 265 points, stretching from Hammerfest, Norway, over to the Black Sea, over more than 2800 kilometers. The arc was built and used between 1816 and 1855 by astronomer Struve in order to determine the length of a meridian segment. The research was useful in the endeavour to establish the exact shape of Earth. At the time of the triangulation, the arc was almost entirely on the territory of the Tzarist Empire, only the northern part being on the territory of the Swedish-Norwegian union; today it stretches on no less than 10 countries. The Arc - through its 34 geodetic point preserved to the present - was included in 2005 into the UNESCO world heritage list. 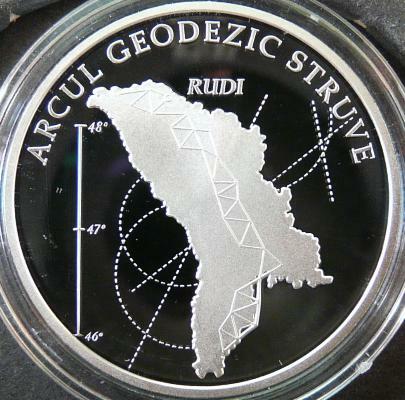 The Struve Geodetic Arc Struve has 27 points on the territory of the Republic of Moldavia. The best known is the one next to the village of Rudi near Donduşeni, where in 2006 a monument was raised. The point at Rudi was initially built in 1847. At Rudi (or Rughi) a monastery exists, built in 1777 under the rule of Grigore Ghica III. The church of the monastery is represented on the coin of 50 lei from 2000. In the 19th century, the measurement of a meridian segment was a very difficult operation, fit to become the subject of a fiction novel; Jules Verne published in 1870 the novel The Adventures of Three Englishmen and Three Russians in Southern Africa, describing the extraordinary adventures of six astronomers performing triangulation operations in Africa.